Auro 3D - zaradics Webseite! 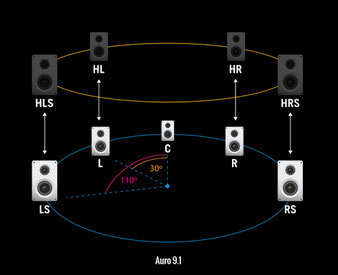 Auro-3D® is the next generation three-dimensional audio standard. It provides a realistic sound experience unlike anything before. By fully immersing the listener in a cocoon of life-like sound, Auro-3D® creates the sensation of actually ‘being there’. Thanks to a unique ‘Height’ channel con guration, acoustic re ections are generated and heard naturally due to the fact that sounds originate from around as well as above the listener. To achieve ‘true sound in 3D’, Auro-3D® adds the crucial third and final dimension in the evolution of sound reproduction. While 5.1/7.1 Surround configurations fail to include height channels (z-axis), Auro-3D® realizes its life-like effect with a HEIGHT-based sound hemisphere capable of thoroughly immersing the listener. Depending on the size of the room, either 1 or 2 additional layers (HEIGHT and TOP) are mounted above the existing Surround layer at ear-level to produce Auro-3D®’s de ning ‘vertical stereo eld’ (see image). This eld is the key to creating the most natural and immersive sound experience possible. The optional (third) TOP Layer placed overhead is a supplementary chan- nel that is not critical for natural audio reproduction. As people are less sensitive to sounds originating from above, the TOP Layer is primarily used for ‘ y-overs’ and other special effects – most sound sources and their chief initial re ections are located between the Surround Layer and Auro-3D®’s unique Height Layer. Auro-3D® is based on a groundbreaking new technology that delivers uncompressed audio quality with an unrivaled level of exibility. The height information, captured in recording or created during the mixing process, is mixed into a standard 5.1 PCM stream. Any device that contains the Auro-Codec® Decoder will be capable of decoding the original Auro-3D® mix, which will conveniently playback on any Auro-3D® compatible speaker system (Auro 9.1/Auro 10.1/Auro 11.1 etc.). Thanks to Auro-3D®’s backward compatibility, devices without the Auro-Codec® Decoder will produce the original 5.1 PCM mix without any loss in sound quality. Auro 9.1 not only delivers an entirely new audio experience in 3D but also offers the most ef cient 5.1 Surround format compatible speaker layout featuring the ‘Height’ dimension.